For as long as she can remember, Amery Carrière has always made jewelry. As a young girl, she would pick up shells on the beach and transform them into wearable art for herself and her friends. In high school, she would create wire-worked rings from the old multi-colored telephone wires that she'd find on the streets after new lines were installed. "I remember the excitement I'd feel when I'd see that telephone truck and the guy up the pole. There'd be feet of that colored, coated copper wire all over the ground just waiting to be transformed into my art!" Now, all grown up, her work is a little more sophisticated. Original wax carvings cast in silver and 14kt gold, accented with rubies and diamonds, have taken the place of sea shells strung on fishing line and colored wire earrings. Her signature style is "Romantic Jewelry with an Edge," consisting of cool textures and shapes imbued with the organic spirit of nature. 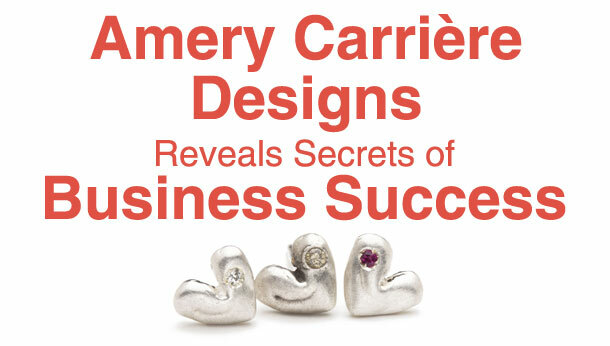 Amery Carrière Designs, the business she started in 1998, services more than 90 wholesale accounts in the United States and Canada. After graduating from college in the early days of the internet boom, she worked as the marketing manager for a high-tech start-up company. Her boss instilled in her the importance of marketing as well as customer service. "He would bend over backwards for our customers," she remembers. "'No' was not in his vocabulary." Shortly after, she went to work as a manager and assistant buyer for a retail jewelry store. She sees this experience as the key factor in her success today. "Learning the business from the retail side first was invaluable to me. It can't be learned in a class or a seminar. Watching the way other successful designers handled their businesses and seeing what pressures and stresses the retailers are under was an incredible experience." Drawing on these lessons as she set off on her own, Amery made a decision to make her new business as customer-friendly as possible. "I know what the retailers have to deal with every day, and I wanted to make their experience with me as easy and fun as I could," Amery says. "I wanted to be the designer who called back quickly and got those special orders out ASAP, all with a smile in my voice." 13 years later, Amery Carrière Designs is a business that is centered on solid, fashion-forward design, as well as old-fashioned customer service. "I'm just as in to the marketing and getting to know my customers' needs and wants as I am designing new pieces. Both sides are so rewarding and exciting to me." How does she obtain such good relations with her customers? First of all, there's a very low minimum at the trade shows. Walk by her booth, and you'll often hear her chatting with potential customers about "telling a good story" and creating a cohesive "grouping" instead of discussing dollars and cents. One of the things she learned from buying for the jewelry store is that sometimes there's a niche that a certain designer can fill for a store, and that's an opening into that venue. "Maybe they can't commit to a $1,000 opening order right out of the gate, but if they are going to put together a cohesive grouping for a few hundred dollars and sell through, why would I turn down the opportunity to work with them?" says Amery. "Working with customers to make sure they get the right merchandise for their store is key for a successful long-term relationship. I'd rather have the customer spend $300 up front and come back for a $3,000 order later than have them walk away because of uncertainty about how the pieces will do in the case." Of course, she has terms, as any good business does; but, instead of hard fast rules, she sets guidelines for herself that can be altered, broken, or even changed if the situation warrants. She does her best to accommodate the differing needs of her customers, from pick-boxes and memo to payment options and merchandise exchanges for new work if the old isn't selling. "The rules are in place so that we all know what to expect. But, my customers know that I'm open to suggestions and can be flexible if they need something special from time to time," Amery says. "Like extra merchandise for an event, or a little longer to pay on a larger order. As long as the lines of communication are open and we all know what's expected of us, we rarely have problems." The key for Amery is to stay flexible and open to opportunity, which includes design suggestions, as well. When she first started her line, she was very closed to design suggestions, and would take it personally if someone asked her to do something different. "It was as if they weren't trusting my design capabilities. But, when I stepped back and really listened, I realized that a lot of the ideas had merit, and they know what they can sell in their store." Now, some of her most "out of the box" designs come from suggestions she's received. Some pieces are named after store owners--Kate and Lisa, for example--and even the Aisha, inspired by a past assistant. "Sometimes, I get caught in my own little design world, thinking this is how I want it to be ... and then someone comes along and says, 'Hey, can you mix turquoise diamonds with rubies in yellow gold?' And I think, 'Now why didn't I think of that first?' It's brilliant." And her long-term customers are beginning to realize just how open she is to suggestions. Amery elaborates, "Just the other day, I had a buyer call and ask if I did a certain hoop in a larger size. I told her, "No," but that I certainly could. She was pleased and surprised that I could do it for her." Every Amery Carrière Designs piece is hand-sculpted in wax by Amery herself and then cast and molded. Although she occasionally does custom, one-off orders for which she may charge a design fee, she generally considers the future sales potential of a piece before agreeing to make a new model for one customer. Nine times out of ten, however, the suggestions are a natural extension of her current line and style. This thinking really came in handy with the downturn in the economy and the rollercoaster metals market. Her line was once very substantial in weight, and when silver and gold skyrocketed, so did her prices. The metals market was very quickly pricing her out of the market. Many of her contemporaries were switching from solid precious metals to base metals plated with silver or gold. Amery quickly called some of her best customers for their input. She credits her survival over the past few years to them. She followed their advice to add pieces in a base metal, but to continue working in the precious metals. So, the heavier pieces are offered in brass as well as in solid sterling silver. Her new work is designed with weight in mind. Larger pieces now have negative space, so she's still keeping her cool, organic yet refined style intact, but they are lighter in weight and still marketable. She's even added a lot of gold this year. It's a risk, but her customers were asking for more gold, especially in the stacking rings. "Gold is always in. It's timeless," she says. "I'm trying to use it in my line in a way that makes it more accessible." Working in mixed metals helps her achieve that goal. By offering a gold pendant on a silver chain, or a set of stacking rings with four silver rings and one gold centerpiece, she can be economical in her design but with the style and touch of extravagance that have made her work a success to date. "The metals market and the economy are still uncertain, but I've done well by taking cues from my customers about what directions to go in. I'll ask them what they need, and they'll tell me about a particular theme or trend that they're seeing, and give me a price point to hit; but they look to me to interpret that information in my own way." In navigating a difficult economic climate, the most important decision Amery has made is to stay active with trade shows and other marketing activities. "The shows have definitely been slower over the last several years," she says. "But, I'm establishing new relationships, and, by offering lower opening orders, I'm still able to get into new stores. When things pick up, as they have recently, that results in more (and bigger) reorders."